I was approached by Banfield Pet Hospital® to enroll in their Optimum Wellness Plan®, and was provided veterinary care through their Optimum Wellness Plan® and 6 months of heartworm protection. Our dogs are a big part of our family, being our original babies, long before Aidan was even thought of. Over time, the focus has come off of them and on to our two legged babies who are slightly more dependent on us. Occasionally, our dog Grace will come over and give us a nudge. I am pretty sure this is her way of telling us that she is still here and would like a little bit of attention. Making time for pets once the babies arrive can be a true challenge, but it’s not impossible. There are plenty of little ways to show your dog you care. Talk To Them: Tell your dog all about your day! They might care more about it than anyone else! Plus, they will be thrilled that you are having a chat with them. They might not understand, but they sure can be there for you! Pet Them: Send your dog straight into doggy bliss with a belly rub. There is nothing better than a good scratch that gets those back legs going. If you don’t have time to get down on the floor, a good scratch behind the ears will do the trick. Play With Them: Dogs love toys! Keep their day busy with plenty of toys, then take them for a nice long walk around the block and everyone will sleep well at night! Make Sure They Stay Healthy: There is nothing worse than a dog with aches and pains. Keep your dog healthy with regular check ups. Preventative care for your pets is just as important as visits for the rest of the family. Happy dogs are healthy dogs. 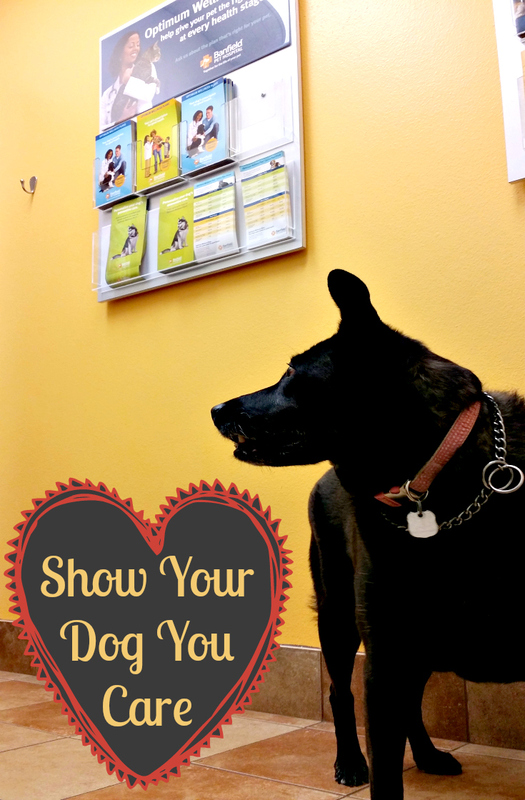 Making sure that your dog is healthy is one of the biggest ways that you can show that you care about them. Living in Southwest Florida, our dogs spend a lot of time outdoors. This also means that they are exposed to the elements on a regular basis, especially to the heartworm carrying mosquito population. I couldn’t jump at this opportunity with Banfield Pet Hospital® fast enough, especially since heartworm disease is one of the most serious and potentially fatal parasites affecting dogs. Setting up my Optimum Wellness Plan® was incredibly easy. I sent a quick email over to the Wellness Plan representative and within 24 hours I was set up. I made Grace an appointment to be seen the very next day at my local Banfield Pet Hospital® location, located in my favorite PetSmart store in Fort Myers, FL. The girls at the front desk were helpful, kindly telling me that Grace might need to lose a few pounds during her weigh in. After a short weight we were brought back to the exam room. Grace was absolutely losing it at this point. 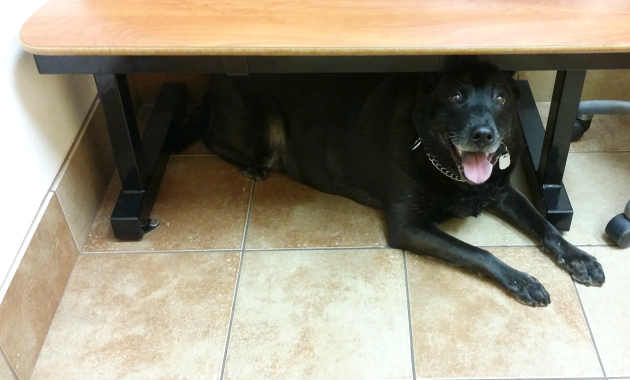 She didn’t know if she should be scared or excited, so she hid under the bench in anticipation! The veterinarian and her assistant came in a few short minutes later. They were awesome! All services were explained to me, including the fact that the Optimum Wellness Plan® included heartworm testing and even a thorough teeth cleaning under anesthesia! Wow! I was incredibly impressed by the Proheart® 6 heartworm protection. Say buh-bye to monthly pills for your dog! This protection comes in the form of an injection that slowly releases over the course of 6 months. Perfect for my mom brain! The Optimum Wellness Plan® includes free office visits for preventative care, and they have multiple customizable plans to fit the needs of your pet. You can find more information about the Optimum Wellness Plan® and even request an appointment online! Before heading out the door, print this coupon for $10 off a 6-month injectable heartworm preventative for your dog! Banfield is even providing one lucky U.S. winner a free office visit for their dog at Banfield Pet Hospital®, a free heartworm test and 6-months of Proheart 6, a $100 value! Tell us your favorite way to show your pet that you care and Banfield will donate $1 per reader comment to Banfield Charitable Trust! Mary is a mommy blogger who lives in sunny Florida with her husband, Chris, and children, Aidan and Avery. She loves all things techie, and even teaches business technology to middle school students!